Here you will find more detailed information on all our classes and workshops. They are listed in chronological order. ​All workshops are held at Mangawhaiartists Gallery unless otherwise stated. To inquire or sign up for any of these workshops please contact the tutor directly via our tutors webpages. Tutors at Work, by the artist tutors Sat 9 June, 10am - 1pm: free and no need to book. Demonstration by the tutors in this Winter Workshop learning programme. You will see them at work and can ask questions about their art. In this workshop you will learn how to draw on your smartphone. Sketch while you are out and about. Make cards for birthdays and special occasions. Drawing and painting on your phone is recognised as an art form – David Hockney exhibits his iphone paintings in major international galleries. Fun, easy and vibrant results. You need a smart phone or tablet. Using free Apps you will learn how to manipulate the brushes and pencils on screen to achieve great results. Limited to five places. Students will learn the ways to emphasise the depth of a landscape painting using Colour and Line. They will analyse the differences between "2-D" (flat) compositions and "3-D" compositions. They will create 2 paintings based on these 2 types of composition using the same reference photograph. cleaning material, hair dryer, container for water. The Art House Painting/Drawing Class, Mandy Thomsett-Taylor Start date: Thurs 14 June, 6 sessions in total, every second Thursday, $450. The Art House, ​40 Thelma Road South. This exciting mixed media art course has an exploratory focus and is suited to students of all levels. If you are a beginner it will get you started. If you are a practicing artist it will energise and extend your work. The course offers a completely unique approach to methods of art making. Beginning with observational drawing, students will progress towards the abstract, continually negotiating fresh and unfamiliar ground. The course is designed to offer a distinct insight into methods of painting and drawing via a series of tutored sessions that explore a broad range of painting and drawing materials and approaches. There will be an emphasis on experimentation and free play within a course structure that focuses on developing essential skills in the visual language of line, tonal values, composition and colour. Classes encompass the spirit of a personal direction and individual vision, encouraging students to develop their individual artistic voice. Additionally, we will look at contemporary and historical examples of art, so as to illustrate how composition and narrative can inform contemporary art practice. You will leave the course filled with ideas and armed with a working knowledge of how materials and process can be used and combined to create marks, depth and texture in your own style. All students will create a large number of art works including finished works. For more information and to book classes please contact Mandy Thomsett-Taylor mandytt@xtra.co.nz, ph 021 843590. Mosaic with Found Objects, Pat George, Saturday 16 and Sunday 17 June, 2 day workshop from 9am to 4pm Cost $ 45.00 which includes substrate, grout and glue. Other materials may be purchased at the workshop. This workshop is designed to give you all a basic introduction to the art of mosaics, from beginners to experienced artists, any age. Learn to create a design to mosaic by preparing your board for indoors or outdoors, cutting techniques (ie tiles china sea glass), glues to use for your projects, and use of different materials to use in your mosaics. Materials, equipment and things to bring with you China, sea glass, driftwood, shells, pebbles, old jewellery, old nails, springs, watches, any found objects you wish to use in your design. Materials provided Boards, Hangers for boards, glue, tiles, some coloured glass and sea glass, glass nuggets, and paper for designs, carbon and tracing paper, mosaic cutters plus grinder and tile cutter. I will bring some bling, copper wire, driftwood, small round mirrors and china to share. Grout and paint to finish project. Gloves and safety glasses. For more information and to book a place, contact Pat George foxhangerstudio@xtra.co.nz, ph 09 431635 / 0212273095. Josie Gritten, is a member of MAI and a professional photographer. Josie will demonstrate and explain techniques and tips for photographing your 2D and 3D art work. For MAI members only – learn how to get good quality photographic images of your art. Bring a notebook, a camera and a small piece of your work. This hands-on technique involves massaging 2 or more layers of charcoal onto the paper, to create a calm atmosphere. Then using hands and fingers, light areas are created and darker tones are added, to bring out an image. Please bring a large A3 size board, several A3 size pieces of cartridge paper, a soft piece of towel or material, masking tape, and wide charcoal sticks. Contact Christine Moginie ph 0211796471 for more details. This demonstration will give an overview of the fantastic range of materials available to artists these days. Covering exciting new colours, surfaces, mediums and brushes, this will inform everyone who works in acrylics, oil colour, watercolours, and mixed media. Evan is well respected for his in-depth technical knowledge, with over 25 years experience of professionally researching artists' materials. This demonstration is proudly sponsored by Gordon Harris, The Art & Graphic Store. Come, choose a fish and print it! Choose paper, a printing block and experiment with printing presses. You will learn to make a waikawa basket, and be introduced to Maori tradition working with flax (tikanga). Flax provided. It's free, it's tutor-less, it’s fantastic fun. Bring your own art gear, something to sit on and something to eat. 10am at the Cemetery or meet at Mangawhai Artists Gallery to car pool 9.30am. Dramatic Drawing, Wendy Leach 5 week tutored course (Fridays) 29 June, 6, 13, 20 and 27 July, 10am to 1pm: $100 plus $10 for materials. All materials provided. ​To join this course please: use this ​registration form, ​or to contact Wendy Leach use this contact form or ph 0226535288. Learn how to make a shopping bag and bottle carrier from old t shirts – Support Plastic Free Mangawhai. You will have the opportunity to print an image on your finished bags. Bring sharp scissors and an old t shirt or two. Students will have fun with these non-traditional tools. They will learn how paints of various colours interact during the process of application. These tools keep a painter away from making unnecessary details and help to think big and 'out of the box'. Materials to bring: big canvas, (it might be unstretched), acrylics, metallic acrylics, wide brushes, a couple of spatulas of different width, a sqeegee, cleaning material, hair dryer, container for water. Materials provided: big palettes for mixing paints. Workshop with Evan Woodruffe for Gordon Harris. Exploring Fluid Acrylics: Materials & Techniques, Evan Woodruffe Thurs 5 July, 1pm - 4pm: $50 All materials provided. Some painting experience is necessary to attend this workshop. Fluid acrylics are the most versatile artists’ colour on the planet! They can be used for wide area and detail, washed, bled, dripped, applied with brush, dip pen, marker, airbrush, and with pipette, mixed with mediums, applied to wood, metal, canvas, paper, plastic and glass. This workshop looks at how fluid acrylics can expand your painting vocabulary, through a range of different surfaces and the various tools for application. In this workshop you will learn to work with Art Silver Clay and will produce either a completed and fired pair of earrings or pendant. Bring along only your lunch and wear comfortable clothing. All necessary molds and equipment will be provided and 10grams of Silver Clay is included in the cost. Extra Silver Clay will be available for purchase if required. Tutor will show the ways of combining painting and drawing within one picture, creating layers of semi-transparent paints. How to seal charcoal elements or blend them into acrylics. Materials to bring: medium to big canvas, acrylics, charcoal sticks, gloss medium (heavy or normal), brushes, palette knives, hair dryer, palettes, cleaning material, container for water. Print week is supported by Kaipara District Creative Communities. Print Week is on for 6 days with some half day and all day sessions to choose from. Beginners are welcome at all sessions. There is a mix of tutored workshops and on the final two days you can print independently or with tutor support. You will need to have made a plate or block to print with. A number of printing presses are available each day. In these workshops you will have the opportunity to experiment with different printing techniques. In the self-managed sessions, you will be supported to try various printing presses and non press techniques. You can also print editions of your work. Your ideas, sketch books or images to develop into prints. Notebook, pencils, pens and drawing equipment. Surgical gloves, an apron or wear old clothes. Clean cotton rags would be useful. You could bring interesting, coloured or textured papers. Demonstration by members of Mangawhai Artists Inc. You will see artists at work and can ask questions and talk to them about their art. No need to book. ​Pouring Technique, Elena Nikolaeva Sunday 22 July, 1 day workshop, 5 hours. $50. Maximum number of participants - 10. How to use pouring technique in painting, creating various compositions in landscape, seascape, floristic paintings. Students will learn how to create a valuable painting, using pouring technique and applying it according their ideas and a subject matter they want to paint. Students will learn the ways how to combine pouring technique with traditional techniques of painting with brushes. They will explore the limits of liquid acrylics. protective material for tables – plastic, newspapers, etc. ​Developing your Artwork, Gayle Forster Saturday & Sunday, 28– 29 July: one day $50 or two days $65​​. This course is designed to run over 1 or 2 days. It is an opportunity for beginners or those interested in understanding the process of creating a series of artworks. The starting points will vary accordingly - these may be students' existing paintings, the creating of new drawings or simply an inspirational artwork. Participants will follow a step by step process from drawing with dry media and extending and developing this into wet media studies which may be further developed. Where relevant, examples of contemporay and traditional works will be used as examples. ​Display of work Opening on Friday 3 August at 6pm and on Saturday and Sunday 10am – 3pm. 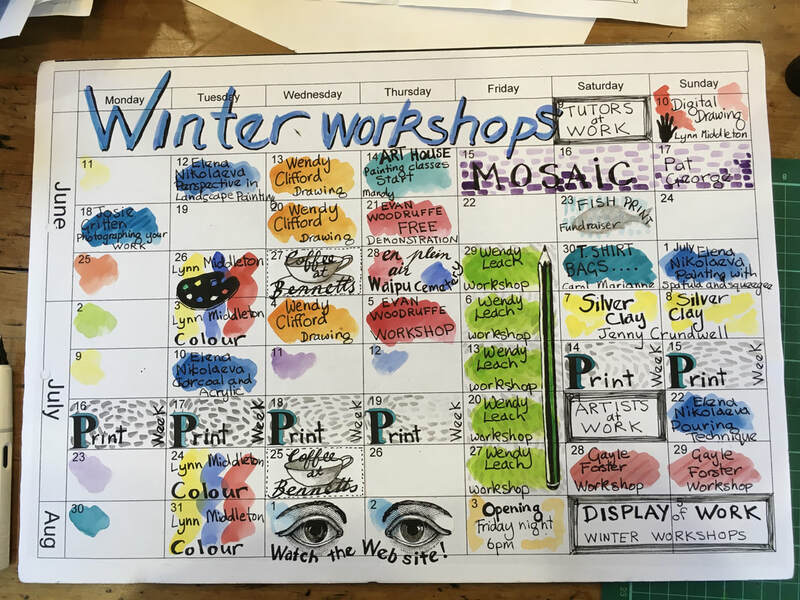 Come along and see examples of the art created during the Winter Workshop learning programme.